TurnKey Linux comes with more than 100 of the most important free enterprise solutions to create a test environment for evaluating new open source system or business software on a local system, on a virtual machine, or in the cloud. Administrators are happy in everyday life if they can finish their work with relative ease. Then comes an order from the powers that be to find time on the side to check whether some new application offers the desired functionality and whether it can be integrated seamlessly into the existing architecture. What decision makers without an appropriate technical background often do not understand is that it is not possible to carry out a careful evaluation "on the side." Setting up such an environment is often associated with considerable effort. You can minimize this effort by using TurnKey Linux. Rapid development in the IT sector makes it more and more difficult for experts to stay up to date. Evaluating new system versions or business software proves to be particularly difficult and time consuming. With TurnKey Linux, you can evaluate more than 100 of the most important free enterprise applications on a local test system and operate the environment on a virtual machine or in the cloud. According to the developers, only open source tools are provided to ensure no license problems or restrictions. TurnKey Linux (TKL) is based on Debian 7.2 and thus provides business applications and security updates for more than 37,500 packages. It is a virtual appliance platform with pre-installed, pre-configured, and immediately deployable applications and software solutions that are compiled with the Linux operating system in a virtual machine. An overview of the pre-installed applications on the homepage of the project website  can be limited to content management, web development, issue tracking, and messaging. TurnKey Linux is managed with the Webmin web-based management interface , which provides the essential administrative tools (Figure 1). Webmin also provides backup software that allows you to back up encrypted copies of data, databases, and configuration files, so you can use them elsewhere. Figure 1: You can manage the TKL system and perform all administrative tasks through Webmin. The Linux distribution is also very lightweight. The basic system starts at about 150MB and only includes the most important components for operating the environment. TurnKey Linux version 13.0 has been available since August 2014. All TKL appliances have been based on Debian since version 12.0; whereas previous versions were based on Ubuntu. The predefined applications are, except for a few exceptions, based on the Debian repositories. This means the applications install easily and perform solidly. Various download packages are available via the project website, and you can use these to run TurnKey Linux on a standalone system or as a VM under a common virtualization solution, such as VirtualBox, KVM, and so on. Installing the various TKL distributions should not pose any major challenges. After installation, you have various ways to administer the system, to access the TKL appliances, or to install new applications. The easiest way is to access the TKL system using a standard browser from any computer by entering https://<IP-Address>:12320 ; the Webmin interface is at https://<IP-Address>:12321 . In addition to the admin interface, a Java-based file browser is available for editing, uploading, and downloading files. Alternatively, a graphical client such as FileZilla is available for all relevant platforms. TurnKey Linux automatically installs a Samba server and can thus be integrated easily into an existing Windows network. If you have decided to use a virtual appliance, download the appropriate package from the project page . The selection menu lets you switch to different application categories. In addition to the ISO and VM images, you will find packages for other supported platforms. For example, you can use the ISO image to install a new fully functional Linux system with a desired software set. If you want to use an image under VirtualBox or other virtualization environment, you need to consider a few peculiarities (see the "Using a Virtual Environment" box). Standard: The ZIP archive containing a ready-to-run VMDK image with a kernel optimized for the VM version. OVF version: The ZIP archive containing the image converted into OVF format, which in particular is supposed to work more reliably with high-end VMware products. Alternatively, you can use a generic ISO image that installs on any computer as a full Linux system or as a VM. Two adjustments are required to the VM environment for optimal performance. 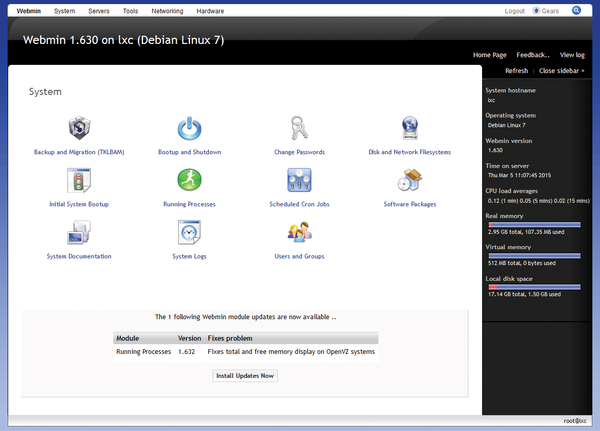 If you use VirtualBox, open the VM settings and enable the advanced option PAE/NX under Settings | System | Processor . This allows the image to address more than 4GB of RAM. The only problem is that NX does not support older hardware. In this case, setting up a complete system using an ISO image instead of a VM is more appropriate. 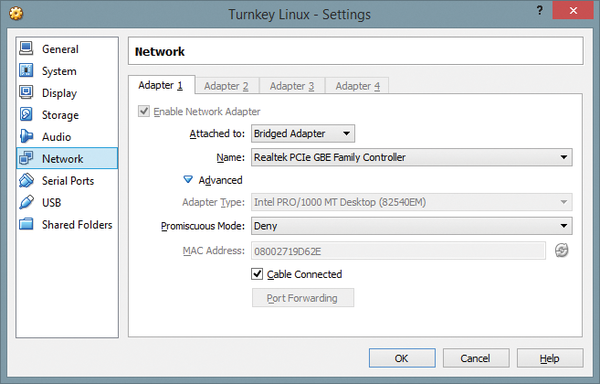 You should also enable the bridge mode for your VM so that computers from the local network also can access the TurnKey virtual appliance. To this end, in the Network tab of the Settings dialog, set the Attached to item to Bridged Adapter (Figure 2). Because these changes involve modifying the VM environment, they are available immediately when configured. Figure 2: When using a VM environment such as VirtualBox, the correct network settings for network-wide access to the virtual appliance are essential. Regardless of the image you ultimately use, the TKL installer, which is based on the Debian installer offers a Guided or Manual installation. To simplify matters, you should choose the guided method, accept the suggested disk partitioning, and confirm further actions such as the system installation and restart. When a success message is sent informing you that the system setup is complete, the appliance installation is complete as well. With the TLK Configuration Console, you can remove the URLs that access the Web interface, Webmin, SSH, and possibly phpMyAdmin access. To access the advanced TKL settings, click Advanced Menu . To access Webmin, SSH, MySQL, and phpMyAdmin, use the username root without a password. Of course, you should change your username and password later. The access codes for the various applications are different. The username is usually admin or root , and you usually choose the password while installing the appliance. You will find the corresponding information on the application's summary page on the TurnKey project site. For example, if you want to evaluate the NoSQL database system CouchDB, the user name for Webmin and SSH is root and the CouchDB user name is admin . You determine the password when you start it the first time. Once you have set up a basic TurnKey system with the desired test environment, you can now turn to customizing the environment. Clicking Advanced Menu in the Configuration Console accesses the advanced TKL settings. 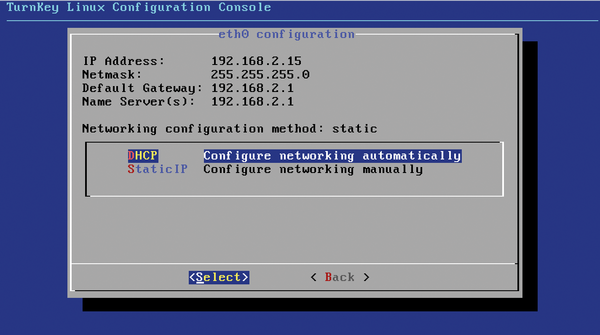 In particular, this allows you to customize the network configuration. To do so, choose the Networking console entry, where you can choose whether you want to assign a dynamic or a static IP address to the Linux system. TurnKey Linux uses a dynamic address by default. To assign a static IP address, select StaticIP (Figure 3) and define the IP address, network mask, gateway, and name server. Figure 3: A first virtual appliance based on TurnKey is installed and available via the web interface. Because The TurnKey Linux environment is web-based, so you need to be familiar with the paths to the web-specific configuration files and executables for your experiments (Table 1). Modern enterprises require powerful ERP and CRM solutions to manage processes, but the high cost of proprietary solutions can be prohibitive. We look at some open source options.